Streaming to a Bluetooth speaker or headphones from a phone, mobile device or Bluetooth-enabled TV can be super convenient. But some of us have a cornucopia of legacy audio gear that we'd like to stream from as well. No one wants to toss a beloved turntable, stereo receiver, CD player, AM/FM radio, or the like just because it was manufactured before the age of Bluetooth. 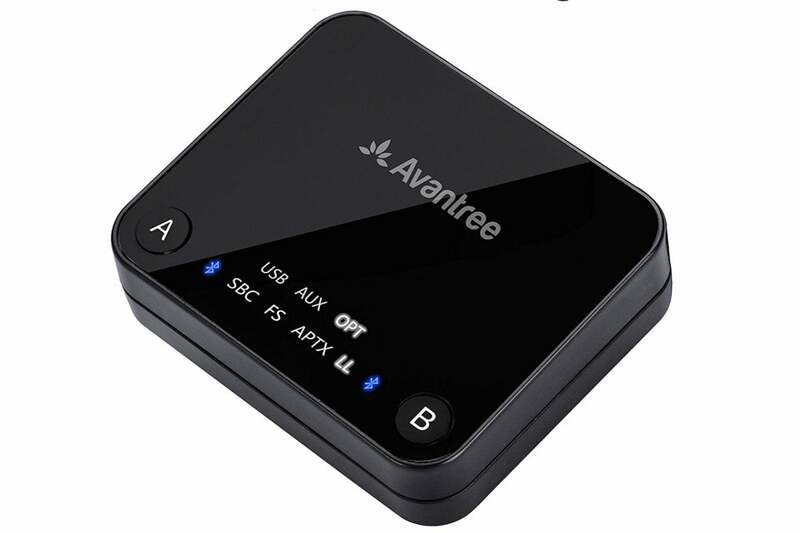 Enter Avantree with its TC418 Bluetooth dual-transmitter. The TC418 not only offers both analog and light-pipe digital inputs, it will also stream audio from just about any device (computer, phone, etc.) that supports USB audio. Video gear is another story because of latency issues. More on that later. The TC418 is a Bluetooth 4.2, dual-transmitter device featuring the low-latency version of Qualcomm's aptX audio transmission codec. 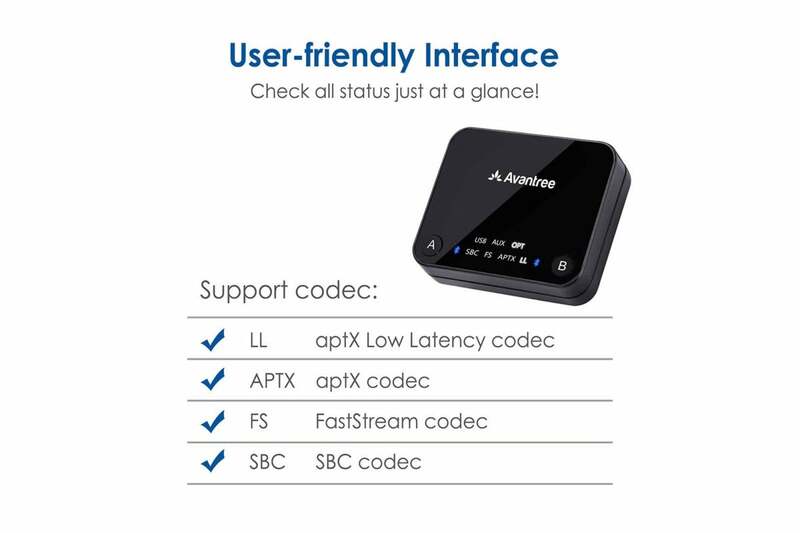 Regular aptX, FastStream, and SBC are also supported (aptX HD, however, is not supported). "Dual" means it can stream to two pairs of Bluetooth headsets or speakers simultaneously. That can be handy under a number of circumstances, including two-room setups. As I said up top, what sets the TC418 apart from many transmitters is the variety of supported connection types. 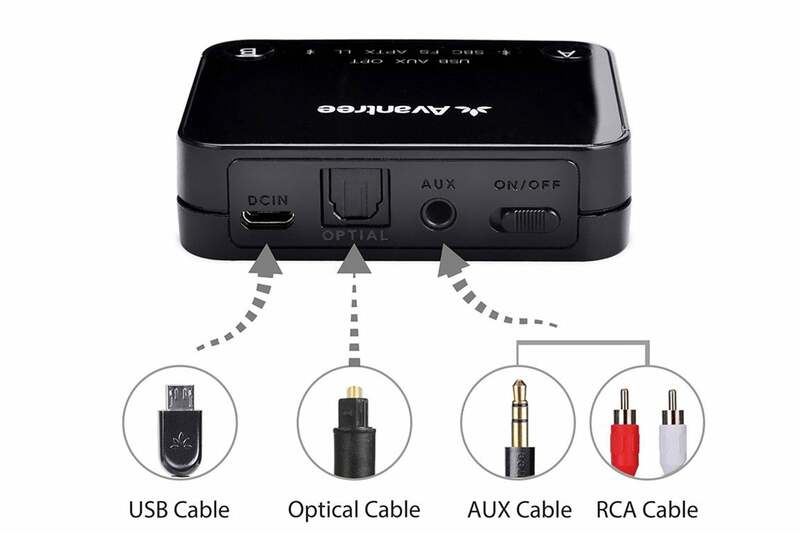 It's powered via its micro-USB port and functions as a USB audio interface, handily allowing you to transmit sound from your computer and anything else that supports standard US-class audio. The legacy support kicks in with a 3.5mm stereo input that accepts both line-level and microphone-level input, as well as a S/PDIF optical port. This means you can use the output from just about any piece of stereo equipment, no matter the vintage. Avantree thoughtfully includes all the cables you might need: a 3.5-mm-to-3.5mm male-to-male stereo cable, a stereo RCA-to-3.5mm female cable that converts the first able, as well as an optical S/PDIF light pipe. There's also a micro-USB to Type A USB cable for the computer connection and power. There's no LED readout on the TC418, but there is a connection indicator light for each of the two channels, and pairing the unit is super easy. Simply press the A (channel one) or B (channel two) button, and then the pair button on the Bluetooth receiver you want to use. The process took about five seconds each time with all five of the speakers and headphones I tested the TC418 with. I live in a tough environment for wireless, the chicken-wire-over-lath that forms the base for drywall and plaster does a good impression of a Faraday cage. The TC418 is rated a Class 1 transmitter, which means you should be able to stream up to around 30 meters under ideal conditions (i.e., line of sight). I didn't fare that well; 30 feet was more like it in my apartment, and it reached around 60 feet in the IDG offices. The TC418 has an analog stereo audio input, an optical digital input, and can also take in digital audio via USB. The "low latency" in the aptX codec's spec means that the time it takes for audio to travel from the TC418 to the receiving devices is made as short as possible--that's approximately 40 milliseconds, compared to 70 to 110ms with regular aptX and other protocols. With 40ms of lag, the delay between what happens on screen and the sound being reproduced on your Bluetooth speakers is what I'd describe as livable. Unlike one claim I saw on Qualcomm's site, it is noticeable, and some with find it irritating. What's more, you won't get that 40ms performance from just any Bluetooth speaker, headset, or other client device: The receiving device must also support low-latency aptX for the whole deal to work, and that's not particularly common at the moment. There is a way, however, to basically eliminate latency issues depending on what you're streaming the video from: If you're playing movies from a computer, simply play the movie using VLC or Media Player Classic Home Cinema and use that softwares' synchronization/time-shift functions to add a negative delay as shown below. There might also be system-level software solutions I'm not currently aware of. Many computer movie players allow you to time-shift audio to compensate for Bluetooth-induced latency. Some TVs and disc players might as well. Check your equipment if you're not comfortable with the 40ms of lag that even low-latency aptX suffers. Some TVs and other devices support audio time-shift as well, though most also transmit Bluetooth, obviating the need for an external transmitter. If you're using a time-shift remedy, then aptX low latency shouldn't make much of a difference and you can factor it out of your buying decision. The TC418 is affordable, easy to use, and small enough to tuck out of the way. To boot, it streamed perfectly for me within about a 45-foot unobstructed radius. If you want to stream Bluetooth from your legacy audio equipment, it's just the ticket. 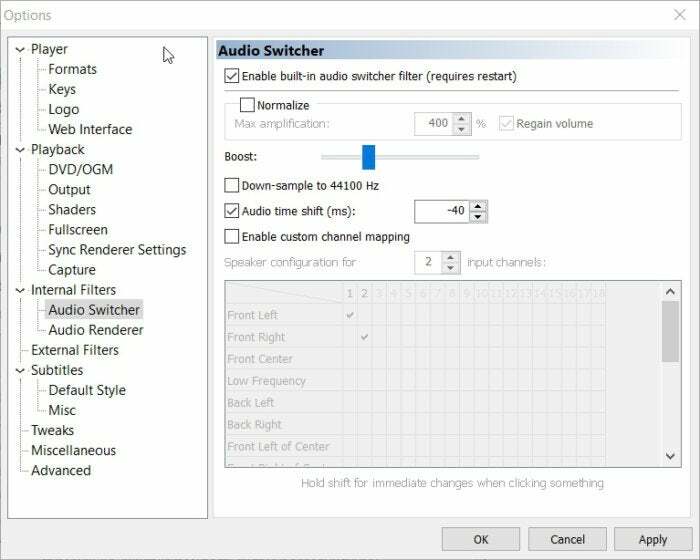 It can work for video soundtracks as well, depending on how sensitive you are to latency. That's not a knock on the TC418, which has as low latency as any Bluetooth device I've used; it's just the nature of the technology. This tiny dual Bluetooth-transmitter accepts signals from your legacy gear and also serves as a USB audio interface, so you can transmit from your computer. It sounds great and has about a 30-foot range. Supports analog and S/PDIF optical input.